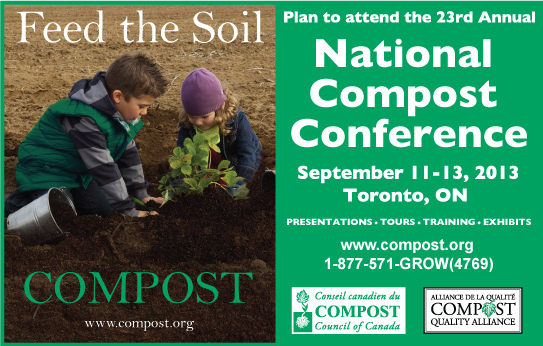 The 23rd National Compost Conference will be held in Toronto, Ontario taking place September 11-13, 2013 at the Eaton Chelsea, 33 Gerrard Street West. The Conference annually provides some of the most extensive opportunities for learning and networking available nationally for those engaged in organics recycling and compost marketing and utilization, providing a national forum. Participants include representatives from all levels of government (particularly with interests in Environment, Agriculture, and Economic Development), industry (organic waste generators, compost system manufacturers and designers, facility operators, consultants and others) and academia. More information can be found on www.compost.org.